How to specify an image and/or text to appear at the beginning of each category or sub-category. What do you mean by Category Content? Why is it important? A proven way to enhance any print catalog is to illustrate key product categories with high-quality images and well-written descriptions. Many businesses improve the readability and interest level of their catalogs by inserting relevant lifestyle images, product image collages, or images depicting the use of their products by real customers. We refer to such images and text as “category content”. What is the purpose of the Category Content Editor? The Category Content Editor gives you an easy way to upload images and text descriptions that you want to appear in your print catalogs. Typically the category labels and hierarchy are retrieved from your e-commerce system. The Editor gives you a way to marry these category labels and hierarchy with your desired images and text. I need to replace the category names in my e-commerce system with headings more appropriate for my print catalogs. Will the Editor address this requirement? Yes, that is one useful purpose of the Category Content Editor. You can enter any text you want to appear in the description. Will this work for sub-categories, as well as top-level categories? Yes, you can specify sub-category content as deep as four levels below the top-level category. Make your print catalogs more interesting and informative by adding images and content at the start of your categories. You might add lifestyle images, composite images of different product, or examples of products in real-world use. Your text can be formatted and colored with descriptive headings. Category content can also be added at the sub-category level. Note: The capabilities described on this page are available only to Catalog Edition Annual Plan subscribers. It requires the "Category Content & Images" Plug-In. Please contact us if you are interested in trying it out. 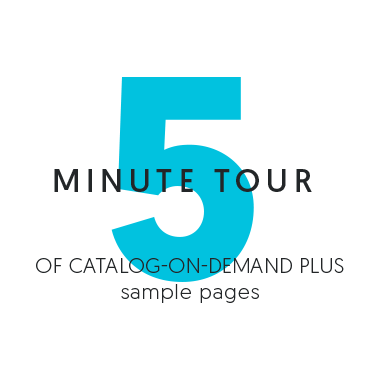 Sign in with your Catalog-on-Demand user id and password. Use drag/drop to change the order of the categories. The image and description are entered on the right side. You can enter either one or both. We recommend experimenting with various image widths and heights to see what works best for your publication and messaging requirements. Start with images that are about 700px wide x300px,tall. Then adjust from there. If you want the image to fill the entire width, make it 1200px wide (assuming a page width of 8.5" and a page margin of 0.25"). The maximum height is 300px, which works out to 2 inches at 150dpi. If you want full width at 300dpi, make it 2400 x 600px. If you only enter a description only, it is left justified. If you enter a description and an image, the description will appear to the left of the image. Move the Plug-In named "Category Content & Images" from the left side to the right side.